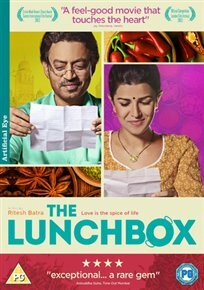 Indian romantic drama – THE LUNCHBOX – realease on Dvd & Blu Ray. Hindi romantic drama directed by Ritesh Batra and starring Irrfan Khan and Nimrat Kaur. Khan plays Saajan, a widowed Indian accounts clerk approaching retirement, who mistakenly receives a lunch box through Mumbai’s daily delivery service. The lunch box was intended for the indifferent husband of lonely housewife Ila (Kaur) and Saajan sends back a note to state the mistake but thank her for the food regardless.